On Feb. 5, civil rights, trade union, student, church, and environmental activists in communities across North America will come together in a variety of events to call attention to a looming crisis in public transit. The diversity of these groups indicates that they recognize not only the urgent need to save what we have but also the potential crucial role transit expansion can play in providing affordable transportation that is accessible to all, that can reduce traffic fatalities and congestion—and that can curtail greenhouse gas emissions driving climate change. But today, New York City’s subways—moving a record 5 million passengers a day—are on the verge of collapse, a major line is being shut down for renovation lasting for more than a year, and their buses aren’t doing much better. Washington, D.C., has neglected even routine maintenance, leading to accidents and delays on the Metro. Transit-union contract negotiations remain highly contentious in Washington and Chicago. Some public agencies continue to contract work out to non-union penny-pinching private outfits who can do it cheaper only by providing inferior service and paying substandard wages. Washington, D.C., is moving to privatize the Red Line subway. More of the same—and even worse—are in store. This is not the first crisis for transit. After setting record ridership numbers during World War II, when there was full employment, no new cars were being built, and tires and gasoline were rationed, the ruling class took America into a very different postwar development scheme. From the end of World War II on, highly subsidized urban sprawl promoted a massive exodus of residents and jobs to new suburban areas. The streetcar and bus lines in the urban cores did not follow them. In many cases, such as in Los Angeles and Kansas City, consortiums of auto, oil, and tire companies became silent owners of transit properties. They dismantled their impressive electrified streetcar and trolley bus networks—which would require many billions to replicate today—replacing them with diesel buses produced by General Motors, as they steadily slashed service. One result in Los Angeles was the introduction of a new word to our vocabulary—smog. Out of sprawl an important new division in the working class soon emerged—either car dependent or transit dependent. 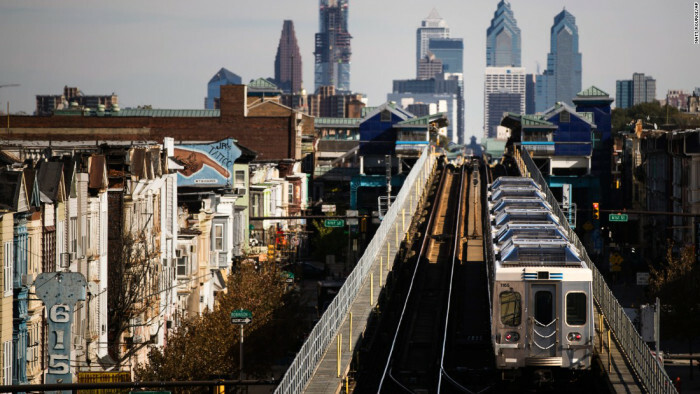 Because a high percentage of the transit-dependent population remaining in the depleted urban cores are African Americans, transit has often been on the agenda of the Civil Rights movement. The chosen date in February marks the birthday of the late Rosa Parks, who became famous for an act of civil disobedience that launched the well-planned boycott campaign to end racial segregation on Montgomery, Ala., buses in 1955. This pivotal action, initiated by Black trade unionists led by E.D. Nixon, is credited with launching the revival of the mass Civil Rights Movement in the South—and propelling Dr Martin Luther King into national prominence. Montgomery led to a Supreme Court ruling that segregating passengers was unconstitutional. Soon afterward, most transit agencies voluntarily ended their ban on Black bus drivers, and today transit jobs are among the best employment opportunities for African Americans. The 1974 Urban Mass Transportation Act stabilized shaky transit systems by providing for the first time billions in federal funding for both capital and operating expenses. During the 1970-90s, new subway systems were built in the Bay Area, Washington, D.C., Atlanta, and Los Angeles. Less densely populated areas such as Seattle, St Louis, and the Twin Cities launched highly successful “light rail” systems linking urban areas to airports and suburbs. But money from Washington for operational expenses dried up long ago, and matching funds for capital improvements are to be almost completely eliminated under Trump’s budget “blueprint” as “offsets” to pay for the mammoth tax cuts for corporations and the rich. Transit Equity Day was called by the Labor Network for Sustainability, Amalgamated Transit Union, Institute for Policy Studies, Jobs with Justice, Partnership for Working Families, and the Labor Community Strategy Center. Their website is: labor4sustainability.org/transitequityday. TED will not be marked by mass demonstrations like those organized around women’s and climate issues soon after Trump’s election. The initiators are setting more modest goals such as getting resolutions passed by organizations, submitting opinion pieces to local newspapers, organizing community meetings to discuss local transit issues—and, where weather permits, outdoor rallies in public places. The choice of the date was a worthy effort to identify with the historic link between civil rights and public transit. But it would have been better to have issued the call much earlier. Some areas were getting started with initial planning with only a month to go. The response on Feb. 5 will give a better picture of the current potential for building the effective transit advocacy movement that is so sorely needed today. >> The article above was written by Bill Onasch, and is reprinted from Socialist Action newspaper.